Smartphone camera lens set helps you to take the most amazing pictures without expensive and bulky equipment! Frame: Made of premium quality aluminum alloy. Lens: Made of advanced optical glass that minimizes glare, reflection and ghosting for maximum clarity. 1 x Fisheye Lens: Takes you into a 3D world. 1 x Starburst Lens: Making magic shining lights. 1 x Super Wide Angle Lens: Great for group selfie! 1 x Macro Lens: 15X zoom out, it capture amazing details. 1 x Super Macro: It capture amazing close-ups like flowers! 2 x Universal Clips: You may share with your family and friends! 1 x Kaleidoscope Lens: It create magical, intricate mosaic pictures. 1 x Wide Angle Lens: Capture 45% more in the picture, it’s great for selfie! 1 x Telephoto Lens: 2 X zoom in, point where, focus where, background is bokeh. 1 x Portable Carrying Case: Protect the whole lens set well when you get out for travelling. Just clip on to your phone and tweak a little to make it align center. They are suitable for most smartphone and tablet, including iPad and Android! ★Tips: For dual camera, please make sure to center the lens over the wide angle lens rather than the telephoto lens. For example, iPhone 7 Plus' wide angle lens is the lens situated closer to the edge of the phone. The lens kit comes in a portable carrying case so you can take it with you wherever you go. 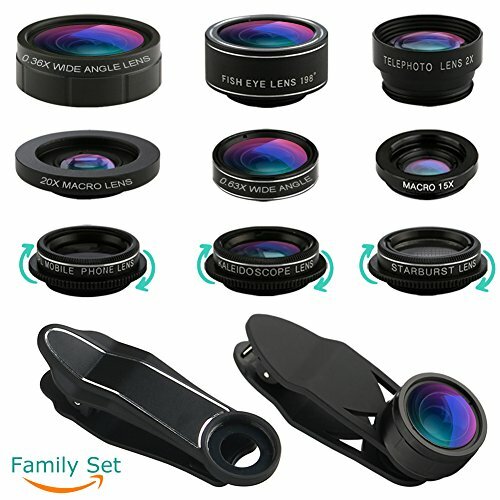 Smart phone camera lens kit, your DSLR lens set. Easy to use, just clip on to your phone and tweak a little to make it align center. Wide angle lens is great for group selfie. Macro lens capture amazing close-ups. Fisheye lens takes you into a 3D world. Two clips in the set, share with your family and go to take amazing pictures together. they are suitable for almost smartphones and tablets, including iPad and Android! You can use the lenses on the front or back camera on your iPhone 7, 6, 6S or 6S Plus, Samsung Galaxy S8, S7, S7 Edge, S6, HTC, Sony, LG, and more! If you have any questions about this product by YIERMA, contact us by completing and submitting the form below. If you are looking for a specif part number, please include it with your message.